"Don't think twice, it's alright..."
I am actually really, really glad that I got everything out about what's been going on with PJ in my last post. I feel a bit like a weight has been lifted and I didn't expect that- I really didn't want to talk about it at all. But it's out and my heart is full of the loving and encouraging words I have received! Still, I learned a lesson. I can't blog and watch Parenthood at the same time!! One of the characters on the show is an autistic child, and I was literally sobbing at my keyboard as I wrote about PJ thinking, "And what if Max and Jabar don't make up??? And can he really write an apology note? WAHHHH!!!!!!" I know that makes no sense if you don't watch the show. I just felt it was important to let you know where my mental status was when I was writing that post. Ahem. I don't expect any of this to be easy, but it'll be okay. 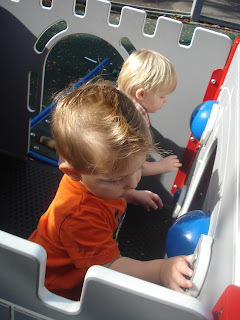 Handsome dudes at the playground! Today was a bit more relaxed after a really busy week! PJ had Little Gym and therapy sessions, playdates and visits with family! Pete was home today, so we all enjoyed a cozy morning together before PJ and I headed out for a lunch playdate with some of our favorites! My amazing friend Michelle is the mama of three, and her youngest, Ezra, is PJ's BFF and going to be TWO in less then a month! Ezra and PJ are only 26 days apart and I can't believe they are both going to be two years old! It seems unreal! In the meantime, we are planning for Halloween and for PJ's 2nd Birthday party! PJ's costume from his first Halloween last year will be pretty hard to beat for me, I LOVED it! Still, we have some fun ideas! I can't believe he's old enough to walk from door to door himself this year! Pete and I are so excited to take him pumpkin picking for the first time! I have the feeling our little wild man is going to love it! It's getting cold outside after a day that was alternately warm and sunny and dark and rainy! Fall in in her Sybil stage, where the weather changes at the drop of a hat! The park across the street, where Pete and I had our engagement pictures done, is starting to look amazing as the leaves start to change! Tomorrow is supposed to be cool and wonderful, so maybe PJ, my camera, and I will have to have a stroll! I had better rest up- PJ likes to run! Good night, friends!